In 1989 UN’s International Maritime Organization (IMO) approved standards and guidelines for removal of offshore installations. This guideline requires that installations on water depths less than 75 meters and with jackets weighing less than 4,000 tons must be removed completely from the oilfield. In deeper waters a free water column of 55 meters is required in order to avoid future dangers for shipping. OSPAR is the regional authority covering large parts of the northeastern part of the Atlantic Ocean, including the North Sea. OSPAR makes direct demands for final depositing solutions of the petroleum installations. Trough the OSPAR convention, an agreement was reached in 1998 stating that all installations with a jacket weight of less than 10,000 tons must be removed. The topsides of all installations must be removed regardless of the size of the installation. For the larger platforms, the main rule is that these must be removed. However, a possibility exists for letting certain installations remain on site, mainly concrete structures that will be almost impossible to remove, steel foundations weighing more than 10,000 tons and installations damaged to such a degree that makes it impossible to remove them. The convention clearly prohibits dumping of scrapped platforms or parts thereof at sea. The environment is of great concern for Norwegians. It is likely that more than 100 installations will be decommissioned on the NCS alone in the next 10 to 15 years, representing a total investment value of several billions NOK. How do we tackle the challenges this represents? SOG has taken a closer look at the industries concerned. Are they all to end up as scrap metal, or could there be other possible uses for this equipment? Going back a few years to the Brent Spar platform, causing a lot of publicity from environmentalist especially in the UK. The solution resulted in the platform being towed to Erfjord in Norway instead of being sunk in the Mid-Atlantic. After being thoroughly cleaned it was cut into sections, filled with rocks and concrete and found it’s final resting place as the foundation for a new pier in the Stavanger area. 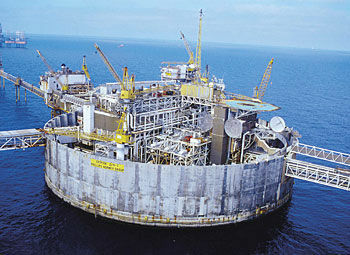 The first challenge will be decommissioning of the old Ekofisk field installed some 30 years ago. Although the ConocoPhillips Ekofisk field will be producing oil and gas for at least another couple of decades, new technologies have rendered the old installations obsolete. 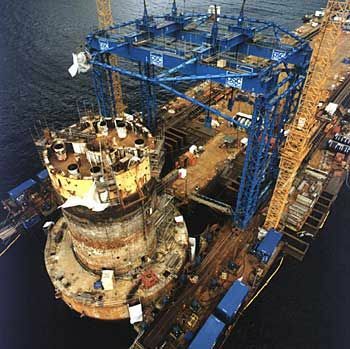 In June 2002 the Norwegian Parliament unanimously approved the Government decision to let the concrete structure of the Ekofisk tank remain, but the topside equipment was to be removed within the next few years, along with 14 steel platforms, for further disposal onshore. Nine of these platforms are to be removed before the end of 2013, while removal of the topsides of the Ekofisk tank are to be completed by the end of 2008. Bearing in mind that as much as 78% of the total cost of decommissioning, less proceeds from sales of scrap iron and usable components, will have to be paid by the Norwegian taxpayers, it is essential to develop methods for these jobs that will reduce the costs as much as possible. The job of removing and recovering the topsides of the Ekofisk tank has been given to the leading demolition and environmental restoration company in Norway, AF Decom AS. They face the challenge of removing and recirculating more than 24,000 tons of metals and bring them onshore for final processing. The contractual value of the project is NOK 440 millions. The work at Ekofisk will start during the second quarter of 2005 and is expected to end in the second half of 2007, while the onshore processing will be completed during 2008. Environmentally dangerous waste will be removed before the structures are removed by special designed machinery with hydraulic shears cutting the structures into suitable pieces for transport onshore. This will be done in containers loaded onto the company’s own supply vessel and taken to Vats in Rogaland where the final processing will take place. The onshore base will then undertake sale and evaluate possible reuse, recirculation and disposal of dangerous waste. The aim is to recirculate 96% of the topsides. Current prices for steel on the international markets, especially in USA and China, are favorable. The major parts of an oil installation are destined to end up as nails. But is this the optimal solution for the industry and government, or is recommissioning of mechanical equipment such as derricks, pumps, valves, turbines and compressors a better alternative? A strong advocate for this is Managing Director of Valiant Industrier AS in Stavanger Sverre Rott. The company undertakes repair and modification work on abandoned offshore equipment and also act as an international broker for this. He sees a potential market for this type of equipment in other parts of the world such as South America, Russia, Africa, the Middle East and Asia and is expecting a boom in demand during 2005. “This type of equipment can easily be brought onshore, overhauled and modified to suit the customers requirements, and then sold on with a healthy profit.” As an example he points to his own company that bought lift machinery from Ekofisk for USD 30,000. After transport onshore, upgrading and repairs the equipment was sold on with a profit of more than USD 100,000. However the government and oil industry shows little interest in the possibilities of increasing the revenue and creating more jobs through recommissioning of equipment from abandoned installations. 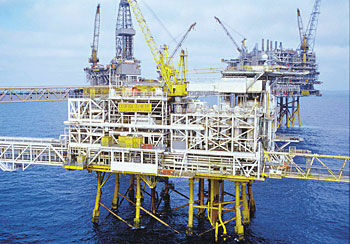 Equipment worth hundred of millions are rusting away in the harsh North Sea environment today on abandoned installations. The current tax regime offers no incentive to the oil industry to preserve and recommission equipment on these installations. “Valiant Industrier AS has over the past seven years demonstrated that it is possible to create new values and jobs through modification and sales of used equipment. It will be highly irresponsible of Norway as a recognised oil and gas nation not to carry out a responsible preservation of the enormous investments made in the North Sea as the installations are decommissioned” states Mr. Rott. Under today’s tax regime it does not pay for the oil companies to stake their money on preservation of values and second hand use of equipment. Favorable regulations for writing off investments in new equipment makes used equipment redundant. The positive effect on the NCS may be that more marginal fields will be developed at an acceptable cost. British authorities have successfully introduced initiatives for companies actively working for the preservation and recommissioning of offshore installations or part of these. This is an active and good utilisation of resources that favors the environment, creates jobs and shows that the industry takes responsibility for the values created. Food for thought Ministry of Petroleum and Energy in Norway?